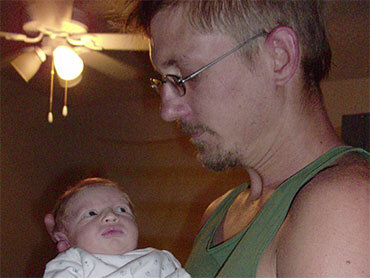 Scott Bucholz is seen with his son, Scott Wesley Bucholz-Sanchez July 18, 2009. SAN ANTONIO (CBS/AP) Scott W. Buchholz, the father of a decapitated baby boy, said he thinks the baby's mother, Otty Sanchez, should burn. "She killed my son. She should burn in hell," Buchholz, 33, told The Associated Press. Sanchez is being held on charges that she murdered and decapitated "Baby Scott," then ate his brain among other gory horrors. Buchholz wants prosecutors to pursue the death penalty. When police arrived at Sanchez' house Sunday they found samurai swords and Sanchez screaming she had killed her baby. Her 3-week-old son was dismembered in a scene so gruesome police were left shaken. Did it have to end this way? Were the signs already there? Buchholz met Sanchez six years ago while they were studying to be pharmacists assistants. He said although his girlfriend had postpartum depression and only recently told him she was schizophrenic, she didn't appear unstable. "She seemed like a very caring, loving mother," he said. "She held him, she breast fed him. She did everything for him that was nice," he said. But Buchholz, who is himself schizophrenic and takes six anti-psychotic and anti-convulsive medications, also said that Sanchez, how had a history of mental hospitalizations, had refused to take medication for her depression. She'd been going to regular counseling and had been briefly hospitalized since the boy was born. Video: Scott W. Buchholz speaks out. "Maybe we missed" warning signs, San Antonio Police Chief William McManus said. "I don't know." Sanchez was released Tuesday from a hospital where she was treated for self-inflicted cuts to her torso and an attempt to slice her own throat. The former home health care worker, charged with capital murder, is being held at Bexar County Jail on $1 million bond. 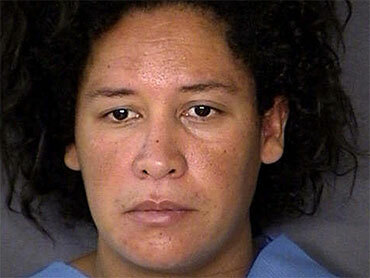 Sanchez told police that the devil made her kill, mutilate and eat parts of her only child. Authorities said Sanchez attempted suicide after butchering her newborn son, Scott Wesley Buchholz-Sanchez, with a steak knife and two swords while her sister and two nieces, ages 5 and 7, slept in another room. Otty Sanchez's medical history is muddled. A family member said Sanchez had undergone psychiatric treatment and that a hospital called looking for her several months ago. Gloria Sanchez, Otty's aunt, said her niece had been "in and out of a psychiatric ward." In May 2008, Otty Sanchez's mother, Manuela Sanchez, called police after her daughter didn't return from a trip to Austin, saying she was concerned about her daughter's safety. Manuela Sanchez said she suspected Otty was into drugs and specifically told police she wasn't suffering from any mental issues. Sanchez was taken to the hospital for depression July 20 and released less than a day later, Buchholz said. Sanchez told him she was schizophrenic and was going to live with her parents and sister. Sanchez was arrested at her mother's house, where police found her and the dead infant. Photo: Otty Sanchez, 33, is shown in this July 27, 2009 photo released by the Bexar County Sheriff's Office. On Saturday, Sanchez brought "Baby Scotty" for a visit but stormed out after Buchholz asked for a copy of the birth certificate and other documents, Buchholz said. Buchholz called the emergency dispatcher to report that Sanchez drove away with the infant without properly restraining him in the car, and deputies investigated it as a disturbance. "If this guy had given us an indication that she had postpartum depression, or mental defects she was suffering from, we may have addressed it differently," said Bexar County Sheriff Chief Deputy Dale Bennett. Buchholz said he may have told the deputy Sanchez was depressed, but that he wasn't sure. While schizophrenia generally develops in men in their late teens and early 20s, women tend to develop the illness, marked by abnormal impressions of reality, later in life. Most new mothers suffer from postpartum blues as hormones shift after a pregnancy and they're fatigued handling a new baby. But as many as one-fifth suffer from the more serious postpartum depression, which includes symptoms like despair and failing to eat or sleep. Postpartum psychosis is far rarer, affecting only about one woman in 1,000. Women with postpartum psychosis have delusions, frequently involving religious symbols and a desire to harm their newborn, said Richard Pesikoff, a psychiatry professor at the Baylor College of Medicine. He testified in the second trial of Andrea Yates, the high-profile case of a Houston-area mother found not guilty by reason of insanity after drowning her five children. Similar to Sanchez's claim that the devil told her to kill her son, Yates told authorities Satan was inside of her and she was trying to save her children. "The most common part of postpartum psychosis is the delusional thinking," said Pesikoff. "Often but not always, it encompasses some type of religious thought." The risk of developing postpartum psychosis is 50 per cent or higher for women with schizophrenia who are not taking medication, said Lucy Puryear, another psychiatrist who was involved in the Yates case.